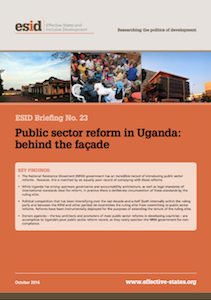 While reforms in Uganda in the 1980s and 1990s aimed at achieving public sector efficiency, those in the 2000s focused on achieving effectiveness through public financial management initiatives and modern management practices. The latter have yielded limited fruits, and this study sought to investigate factors that account for this state of affairs. We argue that implementation of the recent public sector reforms coincided with a shift in the national political settlement in which competition within the ruling NRM party, and between the NRM and other parties, made the ruling elite vulnerable. The threat of losing power distracted politicians at the national level from building a more effective public sector that can deliver high-quality services, in favour of one that helps them to maintain power.